Sydney Shop Girl: It's Not Friday Today, Is It? Christmas Shopping Begins. Thank You, 100 SSG Followers. It's Not Friday Today, Is It? Christmas Shopping Begins. Thank You, 100 SSG Followers. I woke up at 6am this morning convinced it was Friday. Which is fine because I like waking up early on Saturdays - more time to do the things I want to do. What I feel bad about is rolling over to wake up Mr SSG to tell him we had to get out of bed and ready for work. A sculptor's representation of the things between the SSGs when it was pointed out that it was actually 6am on Saturday. 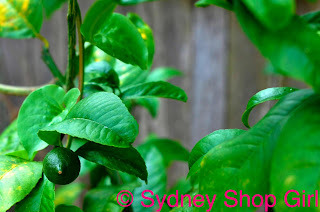 Thankfully, I was more welcome in the backyard where I had a little chat to our lemon tree. It's getting stronger each week and look, it's starting to fruit. I'm very excited about the appearance of actual lemons this year. It's been 3 years since I've seen any on the tree. The leaves were glossier 2 weeks ago though. I wonder if the lack of gloss is due the change in diet I have imposed on the tree. I've run out of citrus food and the only thing left at Coles was Fish Emulsion. Coles aren't lying about the fish bit. Despite the green packaging, it did smell very fishy indeed. 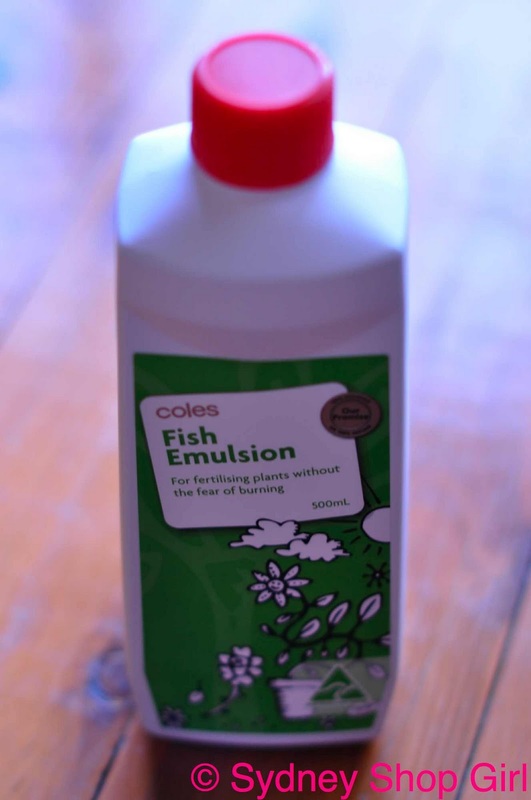 I was hoping that fish emulsion would do for tree leaves what salmon is said to do for human skin. Plump it up and give it glow. I'm going to persist with the fortnightly fish emulsion feeds though, we can't have a starving lemon tree in the middle of summer. Until I can find more citrus food. I hope it hasn't been discontinued. Things I find useful have a habit of no longer being produced. Well, it's 3 weeks until Christmas. I love this time of the year. Everyone is ready for a well deserved break. It brings out the best of human nature. People do unexpected little things for each other. A chance smile in a queue, a phone call or message you've been getting around to all year, the Christmas lights and wreaths at the front of your house that give passers by some festive cheer. Oh, and the parties. Our work do's are pretty modest affairs. We all bring a plate of food to share. I've been researching unique dessert recipes that are quick, travel well and are easy to serve. All will be revealed the week after next when I actually get around to putting it together. The Kahlua was obtained duty free and I think the food section of Ikea houses just the candy I need. 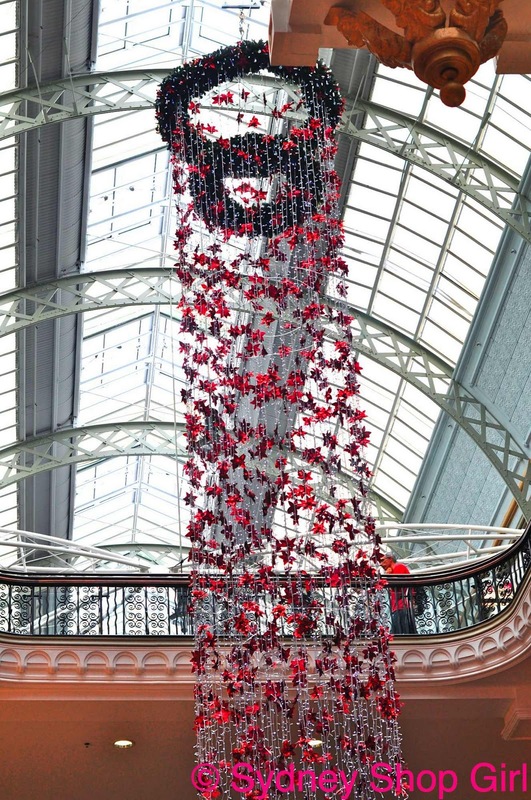 This Tuesday, I'm hoping to attend one of those ritzy Christmas shopping evenings in the city. Mr SSG has gallantly agreed to be my 'plus one' and he just reminded me today that we will be 'there for drinks and not to shop'. Speaking of shopping (as I regularly do), today was stage one of the SSG Christmas Shopping Protocol has now been completed for 2010. Protocol dictates that shopping begins in a large shopping centre, preferably CBD based as this provides a wide range of shops at different price points (multiple branches of the same store is another advantage, more chance of you finding popular clothing items this way). Besides comfortable clothing and shoes, it is also necessary to have all the special discount offers that were mailed to you last week (and the respective VIP cards) on your person. You can leave all those bulky cards at home any other time of the year but at Christmas, you never know where you'll find that perfect gift. Today I started at the QVB. I just noticed that I've reached 100 followers this week. Thank you all so much for your comments, for stopping by and for following. Celebrations and gifts are in order. I was thinking after Christmas. 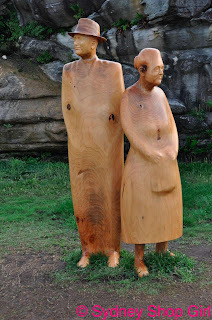 The blog will be a year old by then and we'll all be needing a bit of lift in that laggy time after New Years. An unwritten aspect of my protocol is shopping for myself. I like to get it out of the way early. I usually work over Christmas and miss the sales. I also can't handle the crowds at the post Christmas sales in Sydney. There are lines for change rooms, lines to go up and down escalators, lines for the bathroom, lines for food, lines for a spot to sit down and rest. It's also dicy buying clothes under extreme sale conditions. It gets easy to justify everything you try on, despite the dubious wardrobe longevity of the 'must have' print or colour of the season. My usual goal is to get the bulk of my summer wardrobe sorted. Dresses, clothes for work and shoes mostly. T shirts and tank tops are usually easy to come by most of the year (if you know your size, you don't even have to try them on - the perfect shopping on the run purchase). 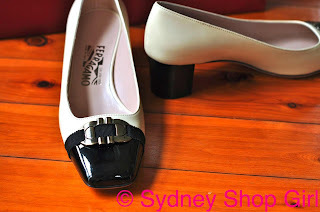 How can anyone say no to shoes called Fun with a 1cm heel? 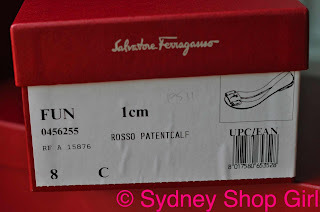 This was my first foray into Ferragamo. They are a dream for the wider footed girl. These particular shoes have a rubber sole and a gold buckle. 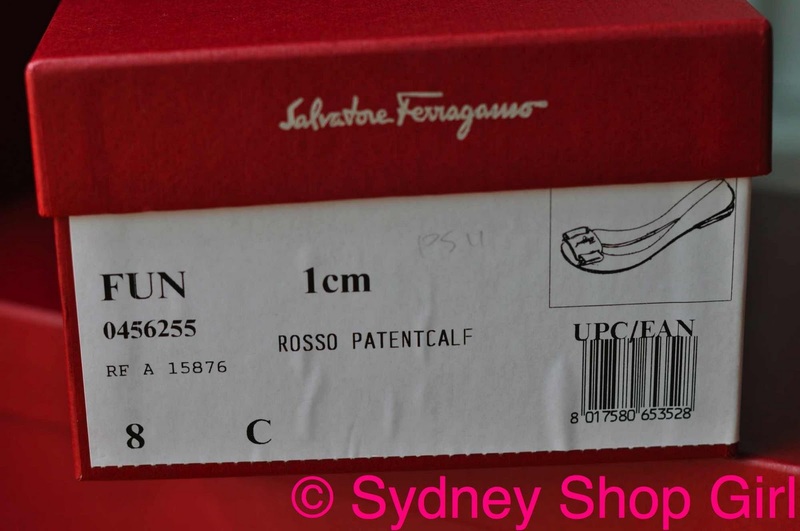 The new 'My Ferragamo' diffusion line is selling really well here and not much was left in my larger hoofed size. After some in depth self analysis, I realized today that I can't just buy one pair of shoes. There's always another outfit that needs the perfect shoes or the need to have shoe with some black on it. One or the other. We could philosophize for hours but long story short. Sale time, white shoe but with practical black tip (to hide scuff marks) and heels (ditto), I don't have white shoes for work and now is as good a time as any. There's something about buying shoes in a colour that you usually don't buy. It opens up a whole new world of wardrobe options. Clothes that previously never went together in your wardrobe suddenly find each other in your mind's eye. 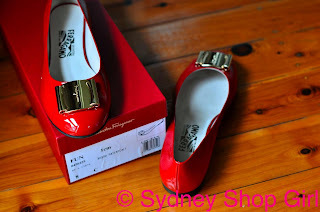 I did say no to patent red pumps though. They were very comfortable and I felt that I could have spent a whole day at work in them but a girl has to be practical. Most of my working day isn't spent sitting at a desk or padding short distances across carpeted floors. Also, a pair of purple pumps. No matter how I thought about my existing wardrobe, there was sadly no place for purple shoes in my wardrobe. Congratulations on the 100 followers...and loving the shoes SSG...especially the red ones...happy shopping. SP: good to know I'm not alone. Ferragamos are my favorites. They last foreffingever. Congrats on the 100 followers. Congrats on 100 followers! Pity we can't see the xmas shopping yet but it could be leaked back to the recipient. Last night my nephew showed me my xmas present under his tree, complete with self-drawn wrapping paper, and shouted "it's got chocolate in it"... it is hard to keep secrets when you are 3! A big congratulations on your 100 followers. You deserve each and every one. PS - I think you should buy the red shoes. Definitely another vote to buy the red heels. They'll work with everything if you let them. Semi Expat: it will happen! !